"Motus" mobile barbeque is the easy solution for a quick barbecue with family and friends. No more waiting for a empty spot at the fire place, carrying around several boxes with cutlery and dishes and no more waste produced by one way grills. What are our everyday life rituals? Rituals play a major in our lives and can dictate our daily routine. Looking for design opportunities by analyzing routines quickly results in a vast amount of possibly impactful concepts. The ritual of going out for a barbecue with family or friends is a very common one and offers great opportunities. Improvements can be especially made in conveniences, logistics and the reduction of produced waste. 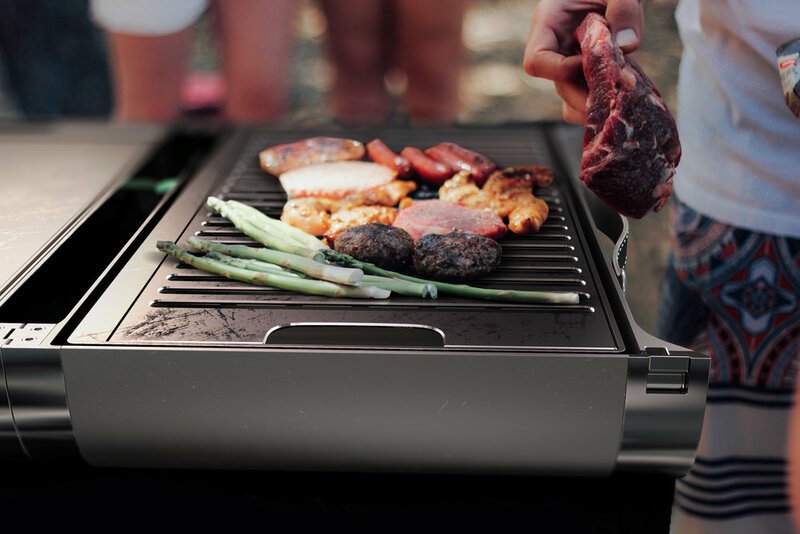 The idea was to combine a gas-grill with a carrying device, thus avoiding the use of one-way products and excess in object to carry when going out for a bbq. After a quick form exploration through sketching and CAD I came to the conclusion, that a suitcase-like grill with several compartments would be most suitable and easiest to handle. The final shape represents a modern look with delicate details while remaining robust and function-focused.